We’ve named the Jaipur Quilt after the capital of Rajasthan and the city most famous for traditional hand-block printing. 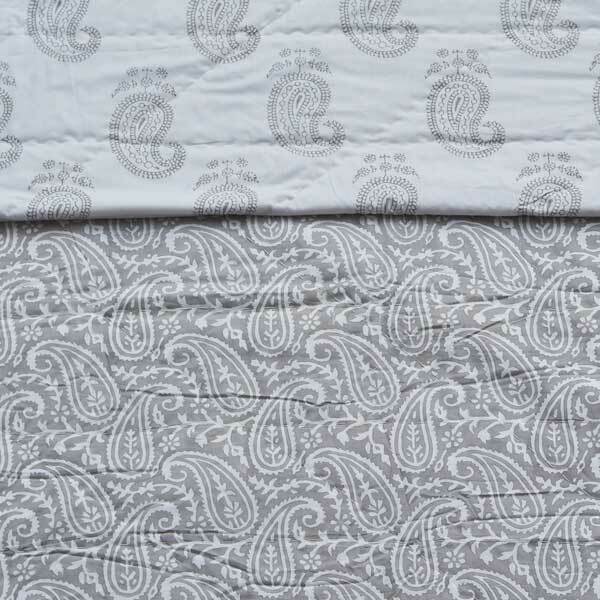 The quilt features the beautiful “paisley” or bootah as it’s known in India. The motif itself originated in Persia but became widely popular in Britain and Europe in the 18th & 19th centuries, when shawls from Kashmir were coveted by the gentry. One of the oldest forms of textile design going back thousands of years to the Indus Valley civilisation, hand-block printing is found throughout India and renowned in Jaipur, Rajasthan. First, a motif is carved into a hard wood such as sheesham (Indian Rosewood) to create a design in relief. The woodblock is dipped in dye and stamped by hand onto fabric. Each colour within a design or motif represents a separate woodblock and reveals the printer’s skill, practised eye and a steady hand. Woodblocks are themselves often works of art and a testimony to the skill of the carver. 220x240cm. Suitable for a king or queen-sized bed. Lightly-padded, our quilts can be used alone over a sheet in mild weather, or with a duvet for extra warmth in winter. They also look stunning folded at the end of the bed, as a decorative comforter. As all our fabrics are made using traditional print-making techniques there can be subtle variations in colours and patterns. Imperfections are normal and are a reminder that the fabrics are made entirely by hand.